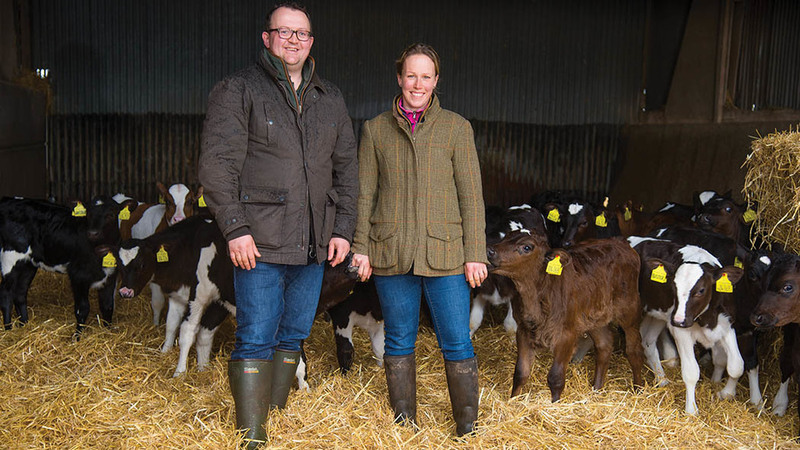 Buffer feeds of grass silage and meal over recent weeks have avoided a crash in milk production for the 450 New Zealand-bred spring calvers managed by James and Lucy Muir near Stafford. The early summer drought came hot on the heels of silaging, meaning action had to be taken to avoid a drop in milk yield. Mr Muir says: “In the third week of July cows averaged 24.27 litres of milk/day at 4.31 per cent butterfat and 3.56 per cent protein – a total of 1.97kg of milk solids – off grazed grass and 2kg/head of meal. It is the first time for many weeks we have not had to supplement grazing with a buffer of grass silage. To minimise the impact, the team opened a clamp of 2016 silage and began buffer feeding ahead of milking while continuing to feed meal through the 20/40 swingover parlour. In late July average daily growth rate was 65kg DM/hectare (26kg DM/acre). Cows were entering paddocks with covers of circa 2,900kg DM/ha (1,173kg DM/acre) with the aim of grazing down to about 1,600kg DM/ha (647kg DM/acre). Residuals left by the herd have influenced the level of silage and meal provided for the following day. Other elements of production may have been affected. Having finished a period of AI followed by a team of six Hereford sweeper bulls on 24-hour shifts, an early PD test on July 12 suggested 70 per cent of the herd were in-calf against a target of 78 per cent. Mr Muir believes heat stress rather than nutritional challenge has had an impact. Paddocks where grass has matured early have been shut up for silage-making to replenish stocks. These may be reopened if dry conditions persist and pre-mown before being grazed by the herd. Sward growth is influenced by a number of factors including rainfall, temperature and daylight hours. Most of AHDB Dairy Forage for Knowledge (F4K) contributor farms have benefited from the combination of heat and rain which encouraged the recovery of daily growth rates to an average of 59.5kg DM/ha (24kg Dm/acre). Last week’s F4K grass samples analysis demonstrated a higher than average fibre value, consequently reducing the ME content and compromising sward quality. Siwan Howatson, AHDB dairy scientist, says: “The key to summer grazing is to provide a constant supply of high-quality grass ahead of the animals, therefore making it critical to continue to regularly monitor swards growth and quality. “Plate meters are an accurate and convenient tool for measuring field covers to determine when grazing should commence [2,600–3,000kg DM/ha] and when cows should be removed from specific paddocks [1,500kg DM/ha]." Failing to meet the desired residuals promotes the amount of dead material and stem at the base of the sward consequently reducing palatability. Allocating mature pasture will encourage continuous under grazing due to cows grazing preference and not wanting to graze fibrous swards. Plate meter measurements are affected by density and it is important to take into account that a high proportion of stem and dead material will increase pasture density and falsify plate meter readings. Therefore visual assessment of the sward and the base is critical to ensure cows are turned out to palatable pre-grazing covers. Flexibility is the single most important key to a successful grazing system in order to cope with unpredictable factors like the weather which can ruin even the best-laid plans. A grazing wedge can be useful in helping to make decisions to rebuild farm cover and rebalancing the supply and demand after a dry period. Ms Howatson says: “A profile of the paddocks DM/ha from highest to lowest is set out on a graph. The pasture wedge visually illustrates the breakdown of the pre-grazing yield distribution on the farm. A line is superimposed onto the graph calculated from the intended herd demand, rotation length and grazing residual and allows you to determine rotation length, supplementation requirement and stocking rate." Monitoring farm covers will help develop and maintain adequate reserves of grass for maximum grass utilisation. A grazing wedge will provide help in making difficult decisions in taking out surplus paddocks during a period of grass growth recovering and to ensure that hasty decisions to remove surplus are not taken. Ms Howatson says: “If you are considering an autumn reseed it is crucial to allow plenty of time for soil moisture to recover, selecting cultivation techniques which reduce soil moisture loss, for example spraying and direct drilling instead of ploughing. Consolidation of the seedbed after drilling is extremely important as it helps to ensure good seed-to-soil contact, reduces water loss and may help control pest issues.